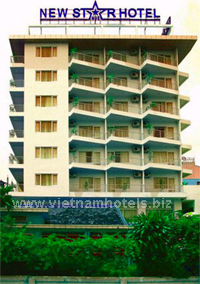 The New Star Hotel is ideally situated in the heart of Hue City and just steps away from the Perfume River. It offers easy access to business and leisure areas, tourist information spots and restaurants. With convenient position, modern architecture, perfect & diversified service, the New Star hotel hopes to be memorable venue when you visit the ancient Hue capital. -Supperior room : Elegant wood furniture, comfortable beds, nice bathroom. -Deluxe Room : Beautiful wood furniture, two twin beds, working desks with chair, nice balcony. - Familly Room : Perfect for the whole family, two double beds, large private balcony. Concept: serving a la carte menus, set menus, daily buffet breakfast with Asian or Western food, and varieties of local specialties.